Every Rice Krispy Treat starts with a little love and innovation. I haven’t made regular Rice Krispy Treats in awhile, and honestly I wasn’t going to start now. It got a little cold out, so inevitably I immediately thought of making hot chocolate. 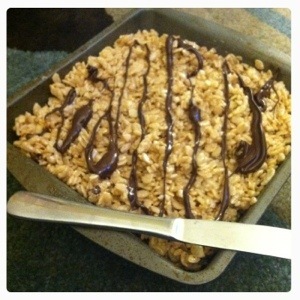 Then genius struck – Hot Chocolate Rice Krispy Treats. 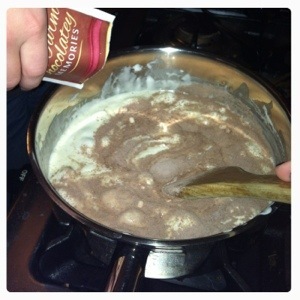 So while I melted the 3 tablespoons of butter and the bag of marshmallows, I dumped in a bag of dry hot cocoa mix. Folded in the six cups of Rice Krispys and then pushed it into a brownie pan. But it was missing something, so I melted a quarter cup of chocolate chips in the microwave. In ten second intervals, melt the chocolate until you can smooth it out, then more it over the treats.